Welcome to the SCJA forum! Check out our Java Foundations FAQ (Java 8 exam) Or see our other forum if you are taking the OCAJP FAQ (new exam). IMPORTANT: Do not post any real questions here! Preparing for a Java SE 8 OCA / OCP certification? in need of mock exams that are free of charge ? Should I pospose the exam? which certification to start with: SCJA or SCJP? After studying for weeks I just failed the practice exam. What should I study? My State/Province is not listed for shipping address - Please guide me! Why SCJA instead of SCJP? 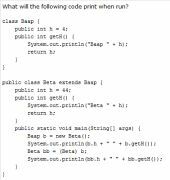 JDBC API in OCA Java 7 Programmer? What would you choose -- certification or keeping up to date with new developments? Why doesn't Oracle offer free certification exams for OCAJ as Sun used to do with SCJA? where could find good deal for scja certification voucher? Is it worth studying for SCJA? SCJA cleared + questions anyone? !